Learn how to clear a clog yourself—no plumber required—using a drain auger (a.k.a. the "plumber's snake"). If it looks like a snake and moves like a snake, it probably is a snake, right? Or, perhaps, its toolbox doppelgänger, the drain auger. 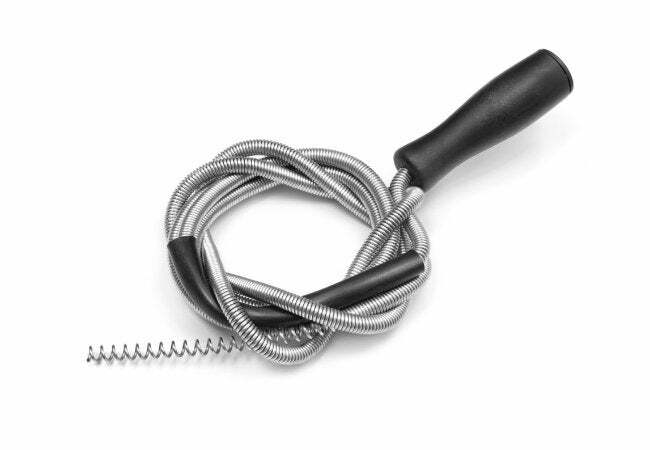 Called a plumber’s snake, this handy tool’s 1/4-inch metal coil breaks up blockages in toilet, sink, and bathtub drains. The next time your plunger won’t clear that clog, wait to call a pro and try to snake it out yourself using the following steps, instead. You’ll first need to get hold of a plumber’s snake, either manual or electric. Some manual models do allow you to attach an electric drill to give the tool more power to push through and break up the clog. At your home improvement store, drain augers cost anywhere from a few dollars for a flimsy plastic model meant to pull out a hair clog to $25 for a longer, sturdier metal coil, or more for an electric model. Think of it this way: While you might spend upwards of $100 on a service call, you could put that money—even just a portion of it—toward buying your own snake for this and all future DIY plumbing work. If you don’t want to buy, you may be able to borrow one from a neighbor or rent a snake from your local home improvement center for a nominal fee. Before you begin, put on a pair of rubber gloves and goggles (especially if you had tried a chemical drain cleaner earlier on), and have a bucket on hand. Then, insert the snake into the drain and slowly feed the line down the pipe. It may take a few tries to get it going. Once it’s in a few inches, gently crank the handle, causing the auger to descend down the drain. As it descends, a tight bend in the pipe may require you to crank the handle a little harder or wiggle the wire, but don’t give up—keep turning. At some point the snake will reach the blockage. When it does, the rotating tip will either break it up as it moves down the pipe or grab hold of the gunk so that you can pull it out. If the stoppage is a solid mass, the auger head will pierce through the obstruction and resist turning. Crank a few more times so that your snake has a good hold on the clog, give the wire a wiggle to help loosen it, and get ready to remove. When you can’t feed the coil any more, simply turn the handle to wind the snake back out of the drain. Chances are the clog will come out with it, either in pieces or as a solid chunk. Detach the debris from your snake and test to see if your pipes are clog-free by running the water or flushing the toilet. If necessary, start from the top and repeat the process. • In the kitchen, when you’re using your garbage disposal, always run cold (not hot) water to flush debris from the sink drains. After you’ve turned the disposal off, keep the water running for at least 30 seconds to rinse the pipes. 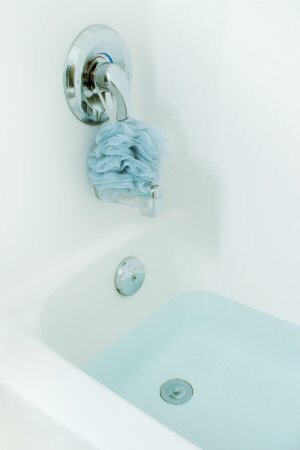 • In bathtub drains, once a week remove the overflow plate and raise the pop-up assembly so you can reach the spring or rocker arm to clear away any obstructions. • In the shower, once a week or as needed remove the drain cover and use a bent wire to clear out any built-up soap and hair clogs. • Last but not least, don’t treat your drain like a garbage can! Your garbage disposal, sinks, and toilet drains aren’t meant to be a dumping ground for debris. To keep backups at bay, never put any of the following common clog culprits down your pipes: grease, fats, coffee grounds, gum, pasta, rice, eggshells, baby wipes, napkins, feminine hygiene products, hair, cat litter, dental floss, bandages, or building materials like plaster and similar compounds.